should have some sort of TIP(Threat Intelligence Platform). I do agree that, however threat intelligence can also be applicable to something as simple as ransomware attacks as I will try to explain in this little write-up. But before we come to this lets make it clear that Threat Intelligence is not a feed with domains, IP's, MD5/SHA1/SHA256 etc. this should be defined as a threat feed. In order for something to be "intelligence", it need to have some sort of context, something that relates data from a threat feed to something else, this could again be ransomware. As very good paper has recently been released by ENISA called "Exploring the opportunities and limitations of current Threat Intelligence Platforms". I'm personally a big fan of the MISP Threat Sharing Platform, this is an ongoing development of many possibilities and is available to everyone due to being a very maintained open source platform backed by many, end with endless possibilities to expand or contribute to. http://www.misp-project.org/ so If you don't allready have a TIP in your organization this is definitely worth a look. this is not the only model that incident responders use but properly one of the most known. The loop goes like "Preperation" -> "Detection & analysis" -> "Containment, Eradication and Recovery" -> "Post incident activity". coming to an "end". This is where the TIP comes in handy, and why everyone should have one big or small it is a matter of learning. A user calls help desk with the information that his screen looks a bit weird there is a message that "All of your files are encrypted with RSA-2048 and AES-128 ciphers." network so that one can't do any more harm than properly already the case. Now this is usually where the internal security team comes in play, but you might be a small team but still applicable. In the detection process you now need to start checking multiple things on is your backup OK, and second has anyone else been affected. The security team now gets a hold of the machine, while also looking into their log system to try to identify what ever they can on the current threat. A sample has been collected from the machine and the sample has been collected. Adding the data into the TIP and storing checksum like MD5, SHA1, SHA256. After this execute the sample in a sandbox, if you don't have one yourself there are public sandboxes or services like virustotal that can be used. Remember that this is not always, a good idea if there is a suspicion of a more targeted attack, as it can give the threat-actor indication on that they have been spotted. But in this case we suspect that this is a standard ransomware attack. After uploading to virustotal.com it confirms that we are taking about a ransomware binary in the family Locky. And with a .7z attachment that included a .vbs file. Also while you do you analysis and enters data the TIP will give you any relations that can assist you in how you should act. Meaning this is more than just an IOC database as it will assist in giving the analyst information for what he or she is up against. As shown in the right in there are already many indicators from other events, that help you make decisions. When all of these indicators are added into the TIP it allows the analyst to visually describe the infection and also in this part be able to identify what security solutions the infection bypassed. Initial security solution that was bypassed was what is implemented on the mail server. Second when the attached file"6N01001367_1.7z" was opened the stage one was not detected by the antivirus. Third a file was downloaded so if any web proxy with scanning capabilities failed. Fourth failure was when the Locky was initiated as stage two this was not detected either. And last but not least either the web proxy or a DNS blacklist failed to detect the communication with both C2 servers and any interaction with payment site. Lesson learned are that we have to learn from the incidents we meet, register what happens respond and act. 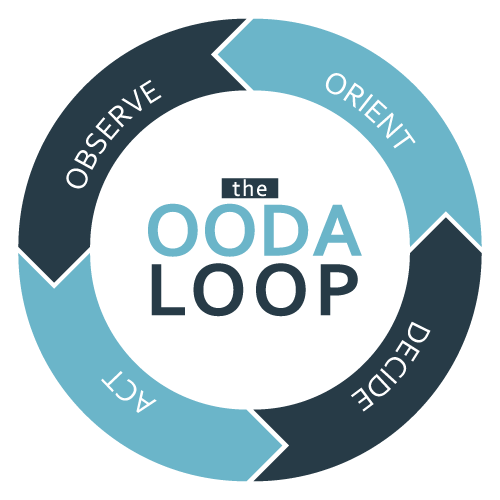 For this I like to merge the concept of the OODA Loop and the Incident response lifecycle. The Incident response life cycle are used and re-evaluated as the word says it to be a life cycle. This means you have to have systems, procedures, processes and people in place and tuned to act when an incident takes place. This is where you need to work in the "Detection & Analysis" and "Continment, Eradication & Recovery" -phase. In these two cycles I personally look to the OODA loop to be able to decide how to act. The OODA states you need to Observe and Orientate based on this you should be able to make a decision and the act. In the above case the initial observation and the data received, resulted in the decision that this case was at first a "standard" ransomware case, that could be acted upon, however always remember to do a full analysis to see if the ransomware is a cover-up for something more targeted. And finally remember to do you post incident analysis. So back to why you need to be able to maintain a Threat Intelligence Platform it will give you insight, relations and data to act upon in a structured way and if you implement your Threat intelligence into your security products it can assist you in acting faster, while also recording what has to be done in the future to avoid this from happening again. Remember a Threat Intelligence platform does not need to be fully utilized from day one, this is a path you are on and the TIP can help you and your team grow and learn. So back to the topic you should have, build and maintain a Threat Intelligence platform to categorize the data you receive, and the incidents you analyze. It will give you an amazing insight into threats towards your organisation. A system to catalog your adversaries and their capabilities targeting your organisation. Gives you insight in what systems need attention. Gives you insight into what user group are seen as the most targeted. If you want to hear more or have any questions please contact us.